Many people ask me the difference between counter height and bar height. It is a pretty simple answer. A standard bar is 42 inches while a standard counter is 36 inches. Now, life would be very simple if all builders followed those simple specs. If your builder decided to pursue his own vision, we have you covered. Our floor mounted bar stools can be made in any height up to 30 inches. This allows us to make a 26 inch stool if your builder built your bar 4 inches short. A floor mounted counter stool is probably the best solution for bars of unusual height or any location where fixed seating adds to the style and decor of your establishment. Our counter stools are built just like they were in the old days using cast iron and steel. Our stools are the ones you typically buy with the restaurant because they have been there for so long pharmacieviagra.com. If you are looking for new stools, please contact us at 800-929-5792. Mounted bar stools are the best bar stools to put in front of a counter in a diner or cafe. Mounted bar stools stay put and always face forwards. It is easy to clean around mounted stools as well. The most important reason to use mounted stools at your counter is that they come in any height. Most counters are not the standard 42 inches or the standard 36 inches. If a counter is not one of these two heights, it is really hard to find a bar stool that will fit. Most bar stools only come in 30 inches and 24 inches. The custom mounted stools sold at BarStoolsandChairs.com can be manufactured in any height. If your counter is 39 inches tall, you can get the perfect 27 inch counter height stool. Richardson Seating, manufacturer of Soda Fountain Stools, retro bar stools, diner chairs and table bases has come up with several new styles of mounted bar stools. All of Richardson Seating’s bar stools and chairs can be purchase from online retailer BarStoolsandChairs.com. Bar Stools and chairs specializes in floor mounted bar stools and logo bar stools. If you are looking for some new furniture for your restaurant or home, you can’t go wrong with retro furniture manufactured by Richardson Seating. Why settle for the same old and boring upholstery vinyl when you can customize your counter stools with your own logo, artwork, slogan, or trademark. Logo counter stools are the perfect way to make your counter stand out. We can do logo soda fountain counter stools, logo counter stools, logo bar stools, and logo bar stools. We can put a logo on pretty much any type of upholstered item but we specialize in logo bar stools and logo counter stools. The counter stool pictured is one of our most popular counter stools. Imagine it with you logo or diner name permanently added to the bar stool. Logo bar stools are durable restaurant bar stools and built to last for years. We can even put logos on our line of retro kitchen chairs. If a logo isn’t what you are looking for, consider using a retro upholstery vinyl pattern like Cracked Ice Vinyl. This website is all about counter stools. Counter stools are the type of stools you put at a counter. There really isn’t much of a difference between a bar stool and a counter stools. Bar stools get put at bars while counter stools get put at counters. I typically refer to soda fountain bar stools or floor mounted bar stools as counter stools. I am not sure if that is correct, but that is what I grew up with. I have been involved in the furniture industry for a long time. Now that I am trying to bring these products to the Internet, I am doing me best to figure out what everyone calls everything. On to the shameless plugs….. 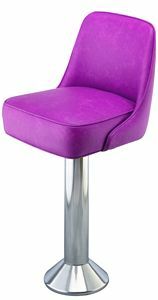 If you are looking for floor mounted bar stools, look no further than Bar Stools and Chairs. 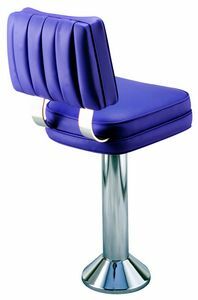 Bar Stools and Chairs sells commercial heavy duty floor mounted bar stools manufactured by Richardson Seating. Richardson Seating is one of the last great manufacturers of floor mounted bar stools that still makes its products in the USA. USA made bar stools still seem to be better than imports. I guess an American manufacturer understands American restaurant needs better than overseas. The counter stool pictured is Richardson Seating’s model 6050-301. It is by far the most popular counter stool. If you are looking for something with a back, there is a whole variety from which you can choose. In addition to my original blog Diner Chairs, I have also started two more. The first one is Metal Bar Stools and the second one is Logo Bar Stools. Please check them out. 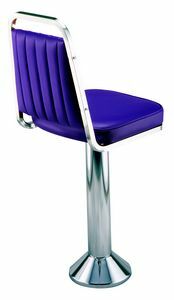 When looking of high quality soda fountain bar stools, look no further than soda fountain stools manufactured by Richardson Seating. Richardson Seating is a bar stool manufacturer located in Chicago, IL. 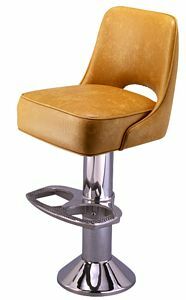 One of Richardson Seating’s specialties is floor mounted bar stools also known as soda fountain bar stools. The reason they are called soda fountain bar stools is because back in the early 1900′s this type of bar stools was commonly found in ice cream parlors and drug stores at the soda fountain. The soda fountain typically had a few mounted stools at the counter so you had somewhere to sit while you drink your custom drink. These bar stools also were very popular with roadside diners and cafes. They were the perfect option for quick restaurants along the highway. Richardson Seating’s line of soda fountain bar stools is just like the soda fountain stools of the past. Richardson pulled out all the stops with this line. The main structure of the fountain stool is iron. Most companies just use steel components. Richardson uses a combination of cast iron, steel, and cast aluminum. Their counter stools are quite substantial. If you are looking to purchase Richardson Seating Counter stools, look no further than Bar Stools and Chairs. BarStoolsandchairs.com sells all of Richardson Seating’s product lines. Floor mounted bar stools used to come in all different shapes and sizes. There used to be hundreds of small manufactures that made bar stools in the US. That number has gotten smaller and smaller over the years. The bigger companies have bought out the smaller companies and both big and small manufacturers have gone out of business. It is really hard to compete with imports from China. Now with all that said, there is still one manufacturer in the USA that knows how to build a commercial restaurant floor mounted bar stool. That company is Richardson Seating. Richardson Seating was established in 1975 after Richardson Seating’s founder sold his previous seating business. Richardson Seating is a family run business and the family that runs it has been in the commercial furniture business for 4 generations. That’s a lot of experience viagraindian.com. Richardson Seating’s dies for its floor mounted counter stools predate even Richardson Seating. Richardson Seating uses highly durable iron components for its line of floor mounted bar stools. They use an iron bushing, iron threaded rods, and an iron bell. Most companies simply use chrome plated steel. Richardson Seating goes one step further by using iron. 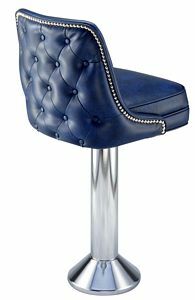 They also have the largest selection of floor mounted bar stools that I have seen. You can find Richardson’s line for sale at www.barstoolsandchairs.com. If you are considering purchasing floor mounted bar stools, you should definitely check out Richardson’s selection. You can’t go wrong with American Made. For information on Cracked Ice Vinyl for counter stools. Remember the old soda fountain at the Drug Store from back when you were a kid? I bet the counter stool pictured looks pretty familiar. For almost 100 years, counters at restaurants cafes and diners have relied on mounted bar stools to comfortably seat their patrons. Over the years, there have been many different manufactures of counter stools in the United States. As time has time has passed, most of those great companies have gone out of business. Lucky for us, there is still at least one American manufacturer of soda fountain bar stools that makes the stools just like they did in the old days. Bar stool manufactuer Richadson Seating manufactures soda fountain bar stools in its Chicago based factory. They make their counter stools used cast iron, steel, and aluminum. Their products are quite substantial. If you are looking to purchase soda fountain bar stools, look no further than Bar Stools and Chairs. Floor mounted Bar Stools are the perfect seating option for those restaurants, cafes, and diners that offer counter seating. Eating counters are a great idea for any restaurant that caters to single diners. Single diners like to come into the restaurant, find a seat, and get served quickly. Providing a counter for those patrons is ideal. The best type of seating to offer those diners is a floor mounted bar stool. Floor mounted bar stools mount permanently to the floor and essentially become part of your restaurant. Floor mounted counter stools are easy to clean around and look great with and without customers. If you are considering purchasing a floor mounted counter stool with a back, make sure your mounted stool comes standard with a return swivel. Return swivel bar stools are best for counters because all the seats will face the same direction when no one is using them. We believe the that mounted bar stools made in the USA are still the best quality counter stools visit this link. Only American manufacturers understand the unique requirements of an American establishment and American clientele.